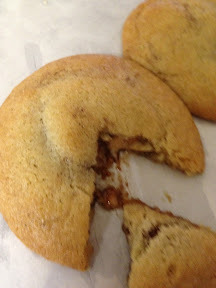 What happens when you mix yummy cinnamon dough (aka snickerdoodle cookies), with the yummy caramel/chocolate candy known as Rolos? 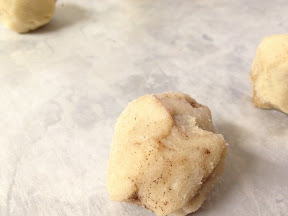 You get an easy, yummy and fun cookie! I found this recipe on Pinterest, and it became another "adventures in cooking" experiment for a weekend adventure with my friend Laura. 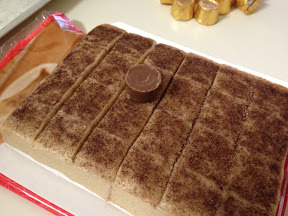 The original pin - and what we tried - used store bought cookie dough. 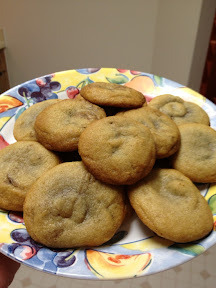 But I could see making these with a favorite homemade recipe. The concept is quite simple. 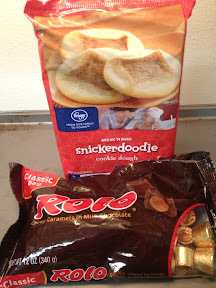 Purchase snickerdoodle cookie dough and Rolos. Step 2) Bake at 325 degrees for the time on the package (or recipe). Pst... you might have to do it a wee bit longer, to make sure the dough is cooked. 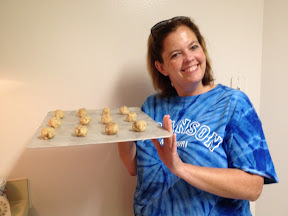 Doesn't Laura make a great cookie model? 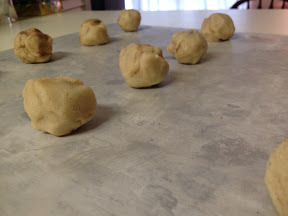 Step 3) Remove from the cookie sheet and cool. Simple? Yep. Yummy? You betcha! Laura took some to her office and they gave them two thumbs up and wanted more! Source: View the original pin here.